Chess, Monopoly, Scrabble and Cluedo may be some of the best-known board games but they represent just a fraction of the table-top games on the market. 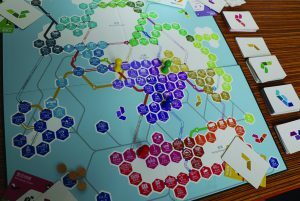 Contemporary board games come in many shapes and sizes and have an ever-growing variety of themes. They are also no longer just a form of entertainment – board game designers are merging entertainment with education, designing games people can play while learning at the same time. Princeton Wong Tsz-fung is a 24-year-old game designer and the cofounder of NightDreamer, a local games company. Their latest project, Electioneer, is a Hong Kong-themed board game based on the local electoral system. There are five geographical constituencies and seven functional constituencies in the game and players have to get the highest number of votes to win. Wong says, initially, he had no intention of developing anything with a political theme – he thought he would introduce the unexplored parts of Hong Kong through a game, especially to foreigners. “I just wanted to create a board game with Hong Kong’s map,” he says. In the process, he discovered unique features and characteristics of various districts and landmarks in the city. In creating the game, he has developed a deeper understanding of his home city, he says. The project was funded on Kickstarter, a global crowdfunding platform. In the space of around a month, Electioneer raised HK$87,794 from 198 backers. Wong regards the platform as a channel for both crowdfunding and promoting the project. The game is being sold online for HK$408 but Wong says the profit margin is slim and the funds from the Kickstarter campaign barely cover the cost of production. Being a board game designer in Hong Kong is not easy. Wong says Hong Kong people tend to be more demanding and have higher expectations of local designs. It is hard to make a living as a full-time board game designer, so he is considering taking freelance jobs in the future. Still, he says the ultimate purpose of making and playing board games is to have fun. “I don’t want to make board games perfunctorily just for the sake of sustaining a living and making profits,” Wong says. Edward Chow Tak-shing is one of the six hosts of BG Port HK, a platform that aims to promote board game culture in Hong Kong. They regularly post board game reviews, recommendations and experiences on YouTube, Facebook and their blog. Chow, who works in education, recalls how he became fascinated by a strategic board game when he visited a board game café 10 years ago. He enjoys playing European games the most, which are not dependent on luck and involve competition between players through indirect conflicts. “I think board games are the best kind of entertainment in the world,” he says. Chow enjoys board games because they can provoke thought while fostering face-to-face communication and negotiations but his approach is not share by everyone. Locally designed board games account for only five per cent of the games in Ho’s café and he attributes this to the lack of talent in the local board game market. Another reason Ho thinks there are fewer local games is that they tend to be more difficult, and people usually prefer easier games. “An interesting game does not guarantee a good sales outcome,” he says. Despite the variety and popularity of video, online, mobile, and virtual reality gaming, board game culture has been on the rise in Hong Kong recently. Compared to when he first started his business eight years ago, Ho says board game culture has become more popular. He says he now has around four times as many customers visiting his shop than when he first opened and around 40 per cent of them are from schools and non-governmental organisations. Ho also sees more parents using board games for educational purposes. 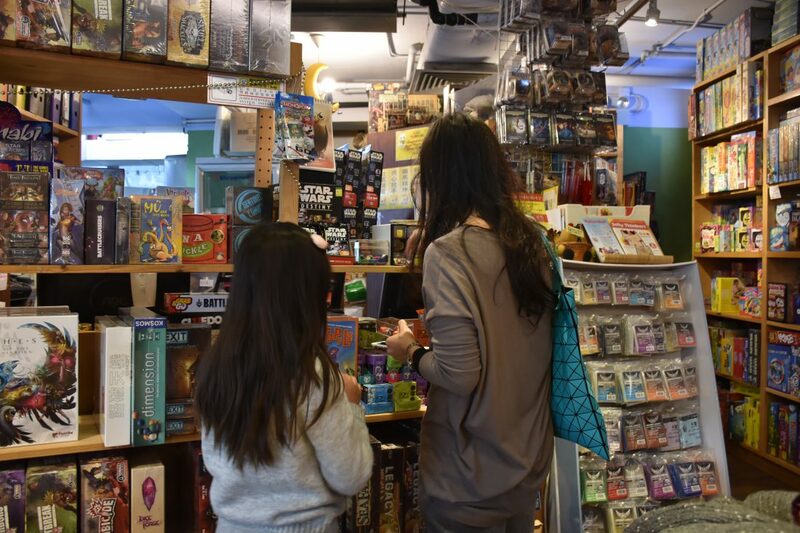 A mother and daughter at a board game cafe. Press Start is a games and events start-up that advocates for the gamification of learning. It collaborates with corporations, schools and NGOs on training, curriculum design, and workshops, integrating board games into education. The group hosts monthly open board game socials to introduce and recommend different kinds of games to players according to their experience level and preferences. Vince Siu Hin-wai, one of its founders, says they hold training sessions and workshops, and welcome newcomers to the socials every month. Participants are not informed about the intended learning outcome of a game beforehand but are simply told to go ahead and play and then there is a casual discussion. Siu says their role is not to guide the players towards a specific outcome but simply to foster a learning environment. But for board game culture to move up to the next level in Hong Kong, Siu thinks there needs to be a change in mindset. “We all know the Chinese saying – playing is not good. But why?” asks Siu. “Does playing mean you can’t learn anything?” He adds that the local education system, especially parents, have to change their way of thinking. For Siu, a player can acquire multiple skills through board games. One of his own favourite games is based on running a craft brewery business. The strategy game conveys some basic principles of the business, such as the ingredients and equipment used. Those who have little understanding but are interested in craft brewing can learn more through the game. Also, he says board games teach players how to react to losing, and can help foster leadership and resource management skills as some games require players to come up with strategies to manage limited resources. These are things school exams cannot do. 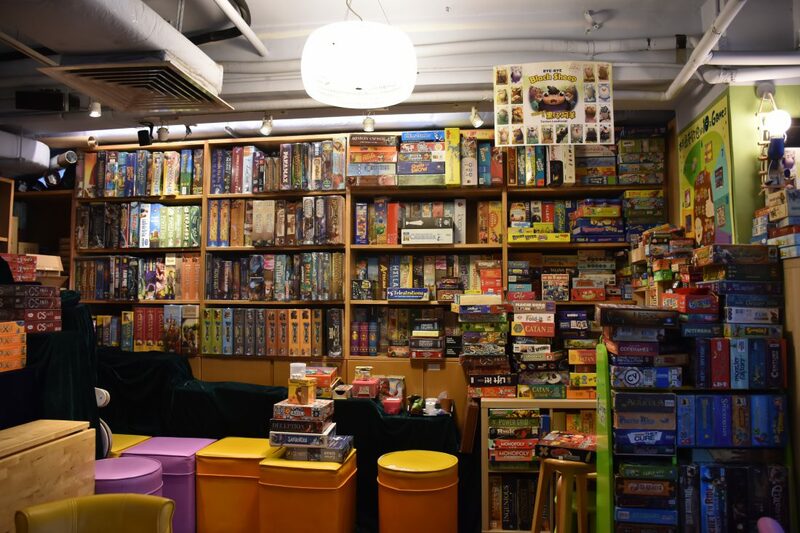 Founded in 2006 when board game culture had yet to become so prevalent in Hong Kong, Jolly Thinkers is one of the earliest board game cafes and game education specialists in the city. As a pioneer in Hong Kong’s board gaming scene, Jolly Thinkers researches educational and entertaining board games from around the world and stages board game activities, workshops, and learning groups for all ages. Apart from running a café and education services, it is also involved in retailing and publishing. Joyce Lam Yuen-han, one of the co-founders, is a former secondary school teacher. “It’s all about the magic of boardgaming and I really want people to know,” she says. Lam thinks board games have the power to connect people and are educational. She wanted to create a relaxing setting for board game players, so she chose to introduce the educational elements in a café setting. “You learn well when you are happy,” Lam says. Another founder, John Guest teaches linguistics at the University of Hong Kong. He recalls the catalyst for starting the business was the occasion he brought his small suitcase of board games to Lam’s house and she really enjoyed playing them. 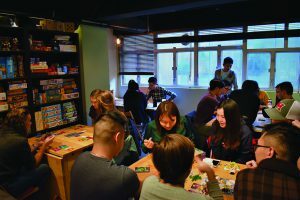 Guest, who spends his weekends introducing customers to games and teaching people how to play them, thinks Hong Kong’s board game industry is developing steadily. He says that whereas most of their customers were adults at the beginning, there are now more students and parents bringing their kids to the café. For Guest, board games are becoming an alternative for those who do not want to be so immersed in mobile games and seek more interaction. In a further development, Jolly Thinkers partnered with a company called Play Infinity to introduce the Boardgaming Instructor Certificate programme two years ago. The course equips educators with the knowledge and skills to teach and provide board game-related services and the certificate is recognised by the World Leisure Organisation. People from different sectors, including teachers, social workers, and even staff from the Correctional Services Department have signed up for the courses. Lam and Guest hope the programme can encourage more people to spread the word about the benefits of board games to a larger audience in Hong Kong. But compared to its neighbours like Taiwan and Japan, Hong Kong’s board game industry is still relatively underdeveloped. Charles Yan Kwing-hung works in the furnishing industry and founded Time2Play Game Ltd in 2010 to provide board game design, production, publishing, and consultation services. He says Hong Kong is still four to five years behind Taiwan, which has a larger population and its own mature crowdfunding platforms. The printing factory that Yan’s company works with is in Taiwan and it produces 70 per cent of Taiwan’s locally designed board games. Yan says production costs on the island are much lower than in mainland China. He says the biggest challenge of the boardgaming industry is the low revenue and profits. In Hong Kong, designers have to take on multiple roles such as project management and promotions on top of designing. In more developed markets, there are editors, publishers and retailers supporting the role of designers. Yan thinks local designers have to aim for the international stage in order to break out of the limited local market. However, Yan sees opportunities in the local board game industry overall. Board game culture is not just a flash in the pan but a popular hobby after years of low-key development, he says.